For my first magazine spread I wanted to write about something I had either personally experienced or was enthusiastic about and I thought writing about travel would be the perfect scenario. I travelled around South America in my gap year and have a lot of fantastic photos from my trip, which I knew would be perfect to use as there would be no issues surrounding copyright. I wanted to aim my piece at a general audience, rather than making it too gender or age specific. I intended it to be an article that could be seen in a travel magazine, reviewing a variety of different places and experiences in an informal manner. Using a lighter tone makes it easier to read and allows the reader to become more engaged. I did not want to write in first person, as it would have come across as more of a travel journal. However, I chose to write about places I had visited because the images I had to accompany this are fantastic and really show case some of the highlights of South American culture. Travel is becoming increasingly popular for people of all ages and so many people are looking for new experiences and many newspapers now publish a travel magazine with their Sunday papers, advertising the top places in the world to visit. My magazine spread was designed to be in line with this style. 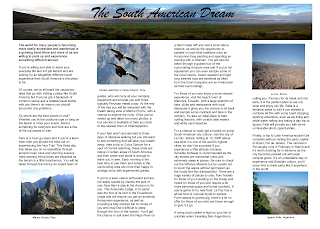 I initially thought about the idea of focussing on one place in South America to write about but by choosing to explore a variety of different places, I felt it could appeal to a wider range of people and their interests, looking at places from nature reserves to popular cities. When I first began to edit my layout I chose a background image of a Peruvian mountain range, however I felt that this deflected from the other images on the page. By keeping the background simple, it draws the eye to the pictures on the page more dramatically. I also considered that using a background image is not very often used in articles such as this for the above reason and a plain white background is more effective. I did have difficulty in making sure that each place I mentioned was not spoken about in too little detail. I did not want to mention an entire catalogue of places as I felt that if the article was too long, the reader could lose interest. By choosing a few carefully selected places to write about, I made sure that it was engaging to people of all ages and interests. 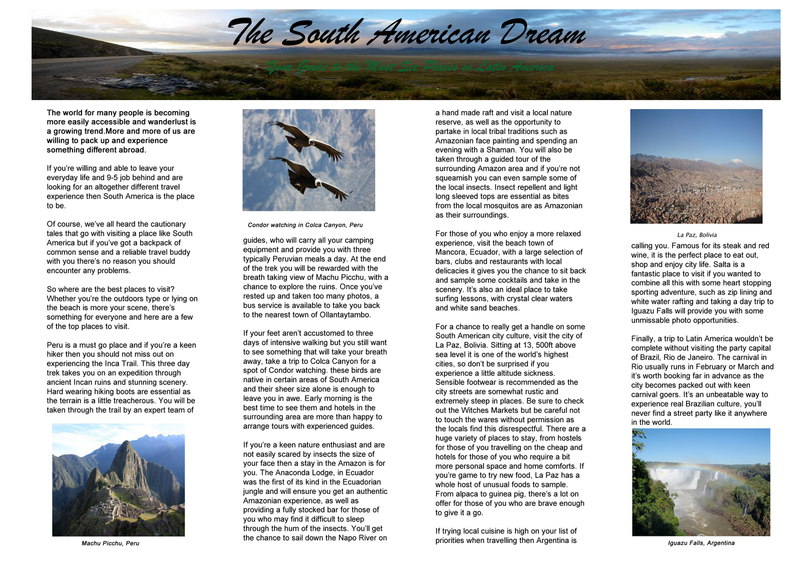 Overall I am pleased with the layout and style of the spread and feel it would be fitting in a travel magazine.